The Tencteri were one of a number of small Germanic tribes to be located on the east bank of the Rhine in the first century AD. 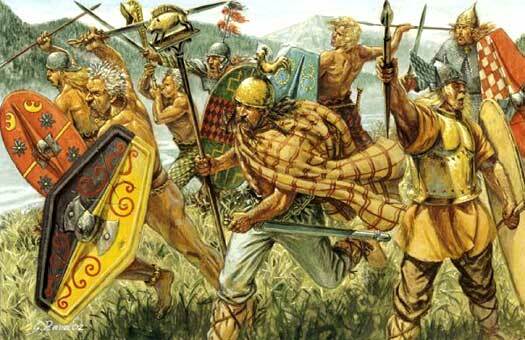 The tribes were fairly closely packed all along the Rhine border with Roman-occupied Gaul. The Tencteri were situated on the southern side of the River Lippe, with the Sicambri on their eastern flank, the Chatti to the south, the Mattiaci to the south-west, the Usipetes to the south and west, and the Marsi and Bructeri to the north. Some secondary or tertiary sources seem to regard the Tencteri as one tribe along with the Usipetes, or at least two tribes with a possible common ancestry. This could be due to their appearance together in 55 BC, when they crossed the Rhine and caused some chaos amongst the Celts there with their excellent light cavalry. However, in their history as recorded by Rome, the Tencteri spent most of their time allied to or neighboured by the Bructeri, further upriver along the Rhine. It has been suggested (by Rübekeil) that the Tencteri name could be Germanic or Celtic, meaning 'the faithful' in both tongues, but while Julius Caesar calls them Germans, simply because they came from the eastern side of the Rhine, it seems that both they and the Usipetes belonged culturally to the La Tène, making them Celts, or possibly Celts with a Germanic warrior elite commanding them. Controversy exists as to whether particular tribes were German or Gaulish (Celtic), and it seems the Tencteri and Usipetes could straddle both definitions. The subject is discussed in greater detail in the accompanying feature. The Germanic Franks were first documented during the third century (the Period of Migration), when they were to be found occupying territory on the Lower Rhine valley (on the east bank, in what is now northern Belgium and the southern Netherlands). They were one of several west Germanic federations, and were formed of elements of the Ampsivarii, Batavi, Bructeri, Chamavi, Chatti, Chattuarii, Cherusci, Salii, Sicambri, Tencteri, and Usipetes. Most of these peoples were living along the Rhine's northern borders in what was by then known as Francia. 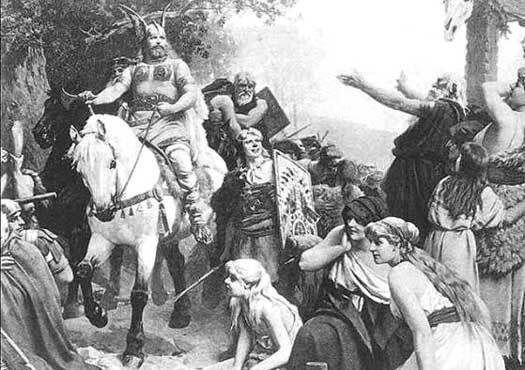 As recorded by Julius Caesar in his work, Commentarii de Bello Gallico, the Germanic Tencteri and Usipetes are driven out of their tribal lands in Germania by the militarily dominant Suevi. This probably places them on the middle Rhine. Throughout the winter they attempt to resettle, but fail to find any land. Their wanderings bring them to the mouth of the Rhine, in the territory of the Belgic Menapii, who are located on both sides of the river. The Germans attack them, forcing them to withdraw to the western side of the Rhine, where the Menapii are able to defend the river line for some time. Feigning a withdrawal to lure out the Menapii, the Tencteri and Usipetes defeat them, capture their ships and occupy many of their villages for the winter. This leaves them free to attack the Condrusi and Eburones tribes. Caesar, alarmed at this threat to the north of territory in Gaul that he has already conquered, takes a force into the region. After much diplomatic effort and some delays, he attacks the Germanic tribes and drives them back into Germania with heavy losses. Both tribes follow the east bank of the Rhine upstream and find refuge with the Sicambri. They remain settled in these lands for much of the remainder of their existence. Caesar crosses the Rhine to follow them and to show the Germans that Romans are not afraid to stage a counter-invasion. Another reason is that a portion of the cavalry of the Usipetes and Tencteri had not been present at the recent battle. Instead they had proceeded to the territories of the Sicambri to join this tribe, remaining defiant, while uniquely amongst the peoples across the Rhine, the Ubii petition Caesar for help against the oppressive Suevi who until recently have been ruled by the powerful Ariovistus. Several other tribes submit to Caesar, but the Sicambri withdraw from their territories on the advice of the Usipetes and Tencteri. Caesar remains in their lands for a few days before burning down their villages and taking their corn. He moves his forces into Ubii territory to show solidarity with them against the Suevi threat before returning to Gaul. Arminius declares the independence of the Cherusci from Rome, decimating three legions in the Teutoberger Forest. He achieves this momentous victory in an alliance with the Bructeri, Chatti, Chauci, Marsi, and Sicambri. While the Tencteri are not directly mentioned, it seems highly unlikely that they are not involved, along with almost all their immediate neighbours including the Dulgubnii and Usipetes. The Bructeri, Tubantes and Usipetes certainly team up to harass the troops of Germanicus AD 14, and they are later included in his triumph. After failing to gain a new homeland in the buffer zone on the lower Rhine that has just been created by Rome, the homeless Ampsivarii tribe subsequently forms a defensive alliance with the Bructeri, Tencteri, Tubantes, and Usipetes. Rome acts immediately, sending troops into the territory of the Tencteri and threatening them with annihilation. All four tribes withdraw from the alliance and the Romans withdraw from their territory, leaving the Ampsivarii utterly friendless. The priestess and prophet of the Bructeri is Veleda. She is regarded as a deity and enjoys a great deal of influence amongst the tribes in central Germania. She lives in a tower near the River Lippe, not far to the east of the Rhine. At some point in this decade, prior to the Batavian rebellion, Veleda is called up to provide arbitration in a row between the Tencteri and the inhabitants of the Roman settlement of Colonia Claudia Ara Agrippinensium (modern Cologne), many of whom would also be Germans. The envoys are not admitted directly into her presence but are forced to communicate with her through an interpreter, and her arbitration is accepted. Gaius Julius Civilis leads a Batavian insurrection against a Rome which is distracted by the events of the Year of the Four Emperors. He is supported by the Bructeri, Canninefates, Chauci, Cugerni, and Tencteri, while the Sinuci are also mentioned as a people who live in the region (although their involvement in the revolt is uncertain). The tribes send reinforcements and Civilis is initially successful. Castra Vetera is captured and two Roman legions are lost, while two others fall into the hands of the rebels. In AD 70 the Chatti, Mattiaci, and Usipetes join in, besieging the legionary fortress at Mogontiacum (modern Mainz). Eventual Roman pressure, with aid from the Mediomatrici, Sequani, and Tungri, forces Civilis to retreat to the Batavian island where he agrees peace terms with General Quintus Petilius Cerialis. His subsequent fate is unknown, but the Batavi are treated with great consideration by Emperor Vespasian. Ptolemy, who writes in the mid-second century, places the Tencteri in the same location as other writers, to the east of the Rhine. He also places the fortress of Asciburgium on the border between the territory of the Bructeri and Tencteri. The name is a Latinisation of the common Germanic word 'Askaburgaz', which means 'fortress of the ash trees'. Writing about fifty years before, Tacitus states that the fortress had originally been founded by Hercules, by which he probably means the Germanic god Thornaraz or Thor. The Germanic Franks are first documented during this century (the Period of Migration), when they are to be found occupying territory on the Lower Rhine valley (on the east bank, in what is now northern Belgium and the southern Netherlands). They are one of several West Germanic federations, and are formed of elements of the Ampsivarii, Batavi, Bructeri, Chamavi, Chatti, Chattuarii, Cherusci, Salii, Sicambri, Tencteri, Tubantes, and Usipetes. Most of these peoples live along the Rhine's northern borders in what is becoming known as Francia. The fortunes of all of these tribes are now tied to the greater Frankish collective. The main body of Chattuarii have probably remained to the east of the Rhine until this period. They are still neighboured to the east by the Chatti and are now to the south of the Bructeri. At this point they cross with the bulk of the Franks and settle between the Meuse and the west bank of the Rhine, while the Bructeri, along with the Tencteri, Tubantes, and Usipetes, do not migrate at all. Instead they remain in their traditional tribal lands and gradually coalesce into the more minor Ripaurian Franks who remain on the east bank of the Rhine.